Everybody gets grey hair and wrinkles as we get older. In the same way, it is normal for our muscles, bones, joints and associated tissues to change as we age. Ageing does not necessarily mean that we will experience increased pain or stiffness. However, if this does become a problem, people often find that treatment and advice from an osteopath can complement GP care and pharmaceutical products. If you do notice problems, your osteopath can work with you to keep you healthier, allowing you to enjoy the pleasures of life into your older years. 150 minutes of exercise per week, in blocks of ten minutes or more (enough to make you warmer and breathe harder, whilst still being able to have a conversation) can help reduce the risk of circulation problems and falls. It can also help to improve your mood and levels of confidence. This might include activities such as dancing or brisk walking. Make sure you eat a healthy, varied diet. Doing some form of balance exercises twice a week (for example, Tai Chi) is also recommend as you get older to help reduce the risk of falling, particularly if you are over the age of 65. Try to also include exercises that strengthen your arms, legs and body. You don’t have to put up with aches and pains simply because you are getting older. 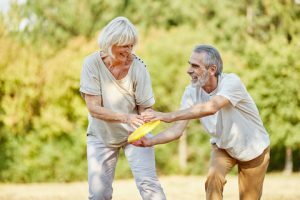 In fact, many people find it helpful to talk to an osteopath about ways of keeping active, preventing common problems such as falls and managing conditions such as osteoarthritis, rheumatic pain and osteoporosis. Osteopathic care is based on the individual needs of the patient and so varies depending on your age, fitness levels and diagnosis. Osteopaths use a wide range of gentle hands on techniques that focus on releasing tension, stretching muscles and mobilising joints. Please call us on 07423 433930 or book online via the home page. This entry was posted in General Health and tagged ache, Aging, discomfort, pain by WO_admin. Bookmark the permalink.